Cream of onion soup, honey, tubs of chopped chives, sugar, cream cheese, margarine, mayo, sour cream: In my house growing up, my mother could deploy infinite combinations of these staples on a moment’s notice, whipped into a no-bake appetizer, and set out with crackers whenever company arrived—or when we came home from college ravenous and craving the tastes of home. A bundle of simple standby recipes shaped my relationship to cooking as an adult, and they’re almost all divined from that most sacred of texts: church cookbooks. The institution of the church cookbook is so pure of intention, and so practical in objective, that it inevitably becomes an anthropological artifact, a snapshot of the era’s most common recipes and the communities that came together to make these comb-bound collections happen. The supremacy of microwave cookery went unchallenged across Chicago’s South Side. 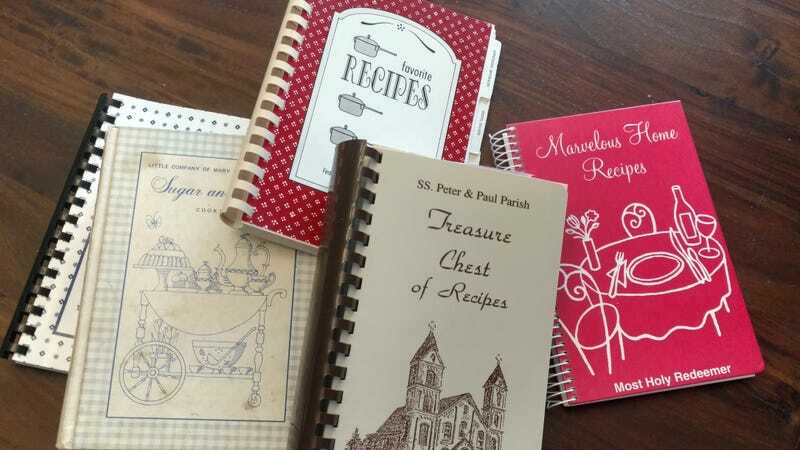 The cookbooks were and remain a collaborative fundraising effort, with the women of the parish soliciting submissions and spearheading the sales. Beyond that, they’re brazenly democratic: You can find them in any thrift store for a dollar, and within lies dozens, if not hundreds of unflashy paragraph-long recipes, where often the most adventurous ingredient is a package of butterscotch chips. The train of progress has rendered most recipes to 1's, 0's and algorithm now, and for free. Recipe sites and meal-prep apps let you search by ingredient, difficulty, and popularity, and many even integrate short videos of each step in the process—a far cry from the alternatively vague and excessively specific instructions provided by Midwestern parishioners (“mix all ingredients together,” “pour salsa in bowl,” etc.). But as comprehensive as they are, sites like Smitten Kitchen and Food52 presume a desire to cook for pleasure, a luxury the Catholic mothers of the ’50s and ’60s simply didn’t have or couldn’t prioritize. Instead, their go-to recipes featured a more uniform ingredient base to save laborious trips to the store (many women of the era didn’t drive), and the yields were enormous by 2018 standards, calibrated to serve families of 12 or more. These cookbooks were nothing less than manuals for feeding your hungry troops, with the occasional cocktail party hors d’oeuvres thrown in. When I bake a dessert from St. Peter & Paul’s Treasure Chest of Recipes, I’m reading the same oil-spattered pages my mom did. And I’m up against the same limitations, memorizing the color-coding and page numbers of favorite recipes, because on the occasion that these aggressively analog cookbooks feature an index at all, you’re at the mercy of whichever congregant compiled it. (Would cinnamon breadsticks be in “This ‘n’ That” or “Yeast Recipes”?) These limitations inform the experience, and they fold unexpected joy into the process. There’s also an element of voyeurism. The communal creation and cursory editing of these cookbooks means that both personalities and idiosyncrasies slip through, for better or for worse. “White Trash Dip” is included in one ostensibly pious tome without incident, and there can be no doubt that Big John was mighty pleased with his subtle trolling of the parish (see below). And was Susan feeling pressure to submit to the cookbook as all her friends were, or is her olive dip (also see below) instead the product of an overeager participant? Whatever the case, it is indeed delicious, and humble enough that you’ll only want to serve it to the people who know you best. I’ll never stop enjoying the discordant little devotionals at the bottom of each page, such as this musing on peacemaking beneath Rita’s 3 Cheese Beef Casserole. “This ‘n’ That” appears to consist mainly of broccoli. Even the best modern cooking blogs are helmed by strangers. Amidst the internet’s defining anonymity, it’s comforting to have a shelf of decades-old cookbooks full of familiar names, the grandparents of neighbors and friends. There’s no fleet of commenters to vouch for Ms. Houlihan’s zucchini bake, nor anyone to weigh in on whether Mrs. Lindholm’s “Easy Chicken Pot Pie” or Ms. Crane’s “30-Minute Pot Pie” reigns supreme. No recipe testing has been done by the editors to earn these entries their place in the collection; no pictures to confirm that the final result looks appetizing. All of these features (or lack thereof) give us no choice but to trust, fully and completely, the industrious ladies who breathed life into these church cookbooks. They require—like anything worthwhile and wonderful—a leap of faith.